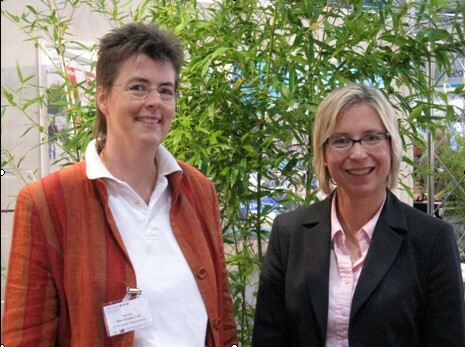 The German Association of Surveying (DVW), Society for Geodesy, Geoinformation and Land Management (member association of FIG) held its annual congress and trade fair this year in Leipzig. Leipzig is a City of 505000 inhabitants in Eastern Germany (North-west of Saxony), the largest city in Saxony and the twelfth largest in Germany. In total 16.500 visitors from more than 50 countries visited the trade fair, approximately one third came the first time. 1.500 national and international experts attended the congress. 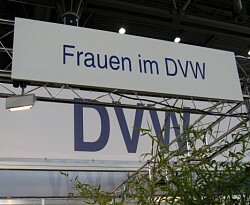 The Congress is a very good opportunity for a meeting of the network “Frauen im DVW” (“Women in DVW”). The network is supported financially by DVW and the chair and one member of the network are members of the DVW Working Group “Profession” (comparable to Commission 1 and 2 of FIG) as well. 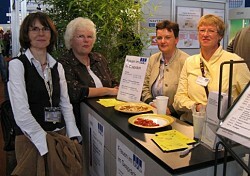 This year the 19th annual meeting of the women’s network took place in September 2007. Thirteen women from all over the country met in this session. The network organises a lot of activities to promote and support women in the field of surveying profession. During the session organisational and financial aspects were discussed and proposals made for several activities in 2008. The activities organised during the last year were evaluated. Reports from the DVW Working Group 1 and the FIG Network “Under-represented Groups in Surveying” are elements of this meeting as well. 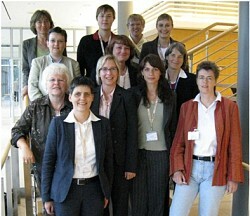 During the last 4 years the Group was chaired by Sonja Andresen (in the photograph on the right sight) and Elke Schultze-Graf. They made an excellent job and were elected again without a dissentient vote for another 4 years. Their next activity will be to organise a workshop including a seminar “Rules and Power Games in Profession”. Topic of the seminar is to exercise strategies to use the rules in the right way and to defend oneself from power games (for example of male colleagues or bosses). We are hoping to meet there a lot of female colleagues to learn together and share experiences. 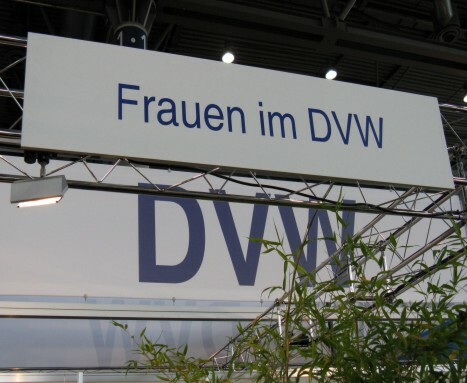 The network is represented at the DVW booth in the exhibition area during the INTERGEO, which offers a good opportunity to contact female and male colleagues. The whole time (except during the session) in minimum one women is there present for discussions or to inform about the network and DVW. This year was the first time that discussions were offered concerning special subjects (for example: mentoring; the advantages to be involved in DVW; female, young and boss). For us the booth is a fantastic meeting place, especially after the session. Canada is currently facing a very difficult situation: 30% of the Canadian population are baby boomers - a baby boomer is a person born between 1945 and 1965 in the United Kingdom, the United States, Canada, or Australia. Following World War II, these countries experienced an unusual spike in birth rates, a phenomenon commonly known as the baby boom. The situation in Canada is not so different from the one encounter in other countries affected by the baby boom such as Australia. The problem is exacerbated by the strong Canadian economy which is expanding and hence requiring more workers. Neither the Canadian birthrate nor immigration are seen to be able to fend the tide of baby boomers retiring. Although many will keep working longer, there will still be a huge gap to fill. It is acute in many professions and most trades. Canada is the world's second largest country in geographical size (Russia being the largest). Canada’s population in 2007 is approximately 33,390,141 spread over 9,984,670 sq km of which 91% is land and 9% is water. Canada has less than 3,000 land surveyors licensed to carry out cadastral surveys. Professional land surveyors in Canada are regulated through 11 separate, self-regulated associations – one for each 10 provinces; and one for the three northern territories (Yukon, Northwest Territories and Nunavut), National Parks and Indian Reserves wherever they are located in the country, and Canada’s offshore. Of course this is not a situation specific to surveying but affecting all professions across the country and this makes it even more difficult to attract new recruits as the competition is intense. The first wave of baby boomers reached retirement age last year and this phenomenon will only accelerate in the next decades. Some of the survey associations have more than half of their members looking at retirement within the next few years. In several Canadian land surveyors associations the average age of members is 55. In some associations, the number of new members is staying steady while in others numbers are dwindling. The has now reached a crisis level and some very focused initiatives are underway in a few provinces to try and attract more young people into the profession. Every survey association in Canada is member of the Canadian Council of Land Surveyors (CCLS) which is an association of associations. A new initiative spearheaded by CCLS is to provide a national vision paper for surveying in Canada around which to rally the member associations to proactively meet the future through coordinated initiatives including attracting more members to the profession. Some of the initiatives currently underway and spearheaded by governments are Labour Mobility Agreement between 10 of the 11 land surveying associations in Canada making it easier for a professional land surveyor to practice in a different Canadian jurisdiction than his or her home association. Even more bold is the Trade, Investment and Labour Mobility Agreement (TILMA) between the provinces of British Columbia and Alberta where “Each Party shall ensure that its measures do not operate to impair or restrict trade between or through the territory of the Parties, or investment or labour mobility between the Parties.” Currently, more than 60 occupations have been identified as having different standards that limit labour mobility between the two provinces. British Columbia and Alberta are to work with occupational regulators to reconcile these standards by April 1, 2009. An omnibus bill, that will amend provincial legislation as required to make it compliant with TILMA, will then be drafted and introduced to the Legislature in February 2008. This obligates the respective land surveying associations to come up with a satisfactory way (to their government) of accepting each others’ members in their own associations in a very simple way such as for example passing a Statute Law exam as this is different in each land surveying jurisdiction. Currently for a British Columbia Land Surveyor to become an Alberta Lands Surveyor, one must write and pass with 75% three exams: Practical Surveying Exam, The Statute Law Exams, and the Surveying Profession Exam; and three 2-4 page project reports on a Parcel Survey/Subdivision (must be a plan of survey); a stand-alone Right-of-Way or Road Survey; and a member selected project on suggested topics such as a Real Property Report, a condominium survey, a wellsite survey, or a relevant engineering survey. Other provinces are watching carefully the developments in BC and Alberta and some are convinced that they too will be faced with some version of TILMA. Studies and reports are being done to better be prepared for such an eventuality. BC and Alberta did not have the luxury of preparation as this was foisted upon them by their respective governments without consultation. It may take years to reverse but many are hopeful that it is not too little too late – for decades the land surveyor has toiled in the background and often as an addendum to major projects. Never was surveying put on par with other disciplines such as engineering. Although the surveyor, amongst a plethora of professionals, is often first and last onsite, no one has been blowing the horn about the major contribution that a land surveyor brings to any project. Canada has a large Aboriginal population and over the next 10 years it is expected that aboriginal youths entering the workforce (age 20 to 29) will increase by 40%. This segment of the Canadian population is one where many are still living a more or less traditional lifestyle off the land. They are outdoors enthusiasts, they know the land in a way that many Canadians do not. Their affinity with the land seems to make a perfect fit for a surveying career. However most do not graduate from high school. Efforts are needed to address this and bring more Aboriginal youth to surveying as a career. Similarly the women population is one where surveying is not even remotely considered as a potential career. Land surveyors have to do a better selling job to reach these pools of workers. It seems that crisis always bring to the fore all the details that no one has paid attention to when the “going was good”. Well that time is here now and the details are being attended to – but are it too late? Only time will tell. She is a young lady, married, mother of three small children; she was born in Greek countryside (Chalkidiki). She studied as Mechanical Engineer at the AUTH (Aristotle University of Thessaloniki). 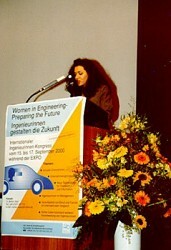 In 1998 she obtained her doctoral thesis in the sector “Thermodynamics and Strobilomichanes” of the University of Karlsruhe. In 2005 she undertook the address of the Department of Research of - Market of Audi that it resides in Ingolstadt of Bavaria. She never had herself the dilemma between career and family. She believes that a woman can be also woman and engineer and mother, and also to take part in other activities. This attitude of life has, however, her price: she has never time for herself, because she works long times and any her free time dedicates in her children. “This is the price that I pay but I know it. I make it voluntarily and I know very well that this is something that will accompany me in my life. I make it, however, with very big pleasure and I believe that I am good mother, because I am good in my work ", she said in a Deutse Welle interview. In congresses, interviews, seminars that she organises herself in her company, but also in the old days, as a Boarding Member of the German Association of Women Engineers, she supports vigorously the necessity of promotion of feminine executives. She is worldwide known as woman example between other women who have power in the hands their, women that they play a leading part in their professional sector.